The main symbol of Hanukkah is the Menorah, and we have three Menorah crafts to enjoy with your children. You can also print, decorate and play with our Dreidel, and have a go at our Star of David craft. You can also have some fun with some potato printing! Here is a fun and original way to represent a Menorah, as well as record your child's handprints. This handprint Star of David is very quick and easy - even the youngest children can do it! We used the Star of David and dreidel for inspiration with our Hanukkah potato printing. 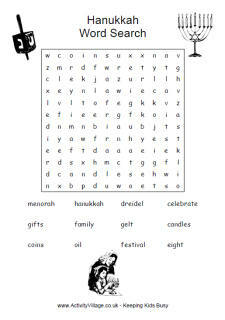 This Hanukkah Wish Star makes an excellent family or classroom activity, encouraging children to think about what they are grateful for and their hopes for the year ahead. This sparkly Star of David decoration looks lovely hung in the window at Hanukkah. For younger children an adult could stick the sticks together, leave to dry and then let the children decorate.